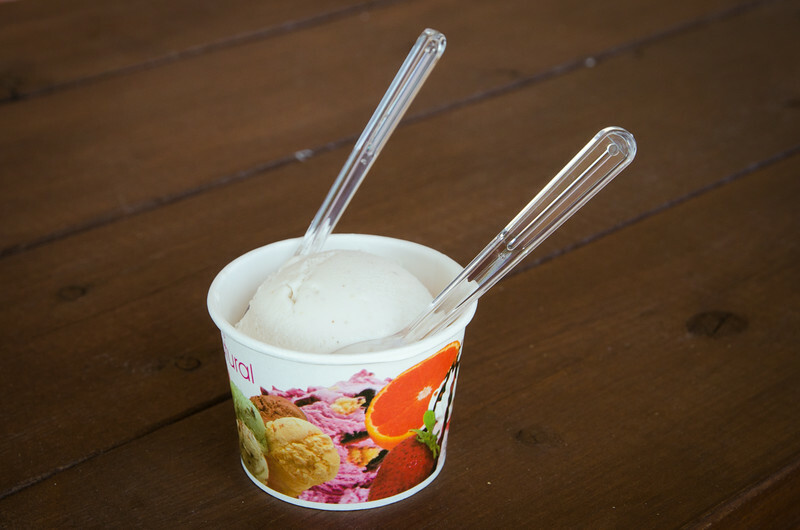 With a name meaning ‘Island of the reclining cow’, how could we say no to Udo Island?! Unbeknown to most, since 2007 the local authorities have been steadily establishing an interconnecting network of walking trails around the perimeter of Jeju Island, knowns as the ‘Jeju Olle’. 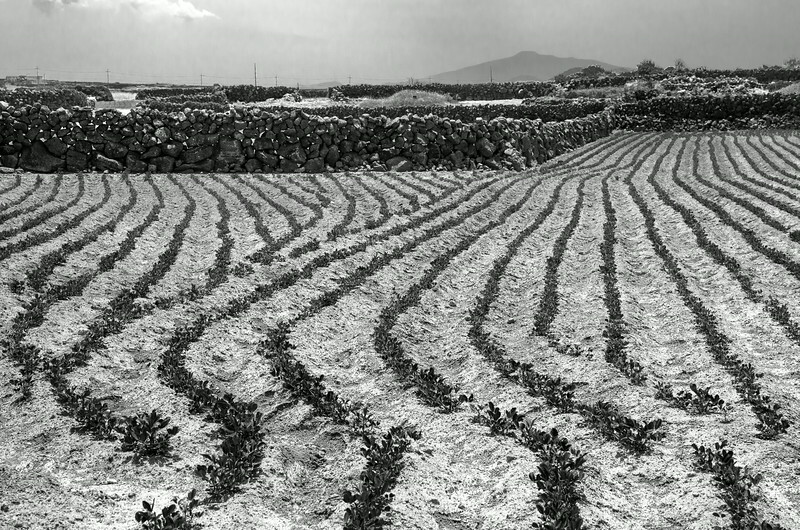 The term ‘olle’ actually means, ‘the narrow path between the street and your doorstep’, but over the centuries has grown to refer to the many well-trodden paths that dot the Korean landscape, and most particularly, those on Jeju Island. Many are simply outstanding, others a little mundane, but regardless of which section you choose to walk, you can guarantee you will see a side to South Korea that you won’t get anywhere else. 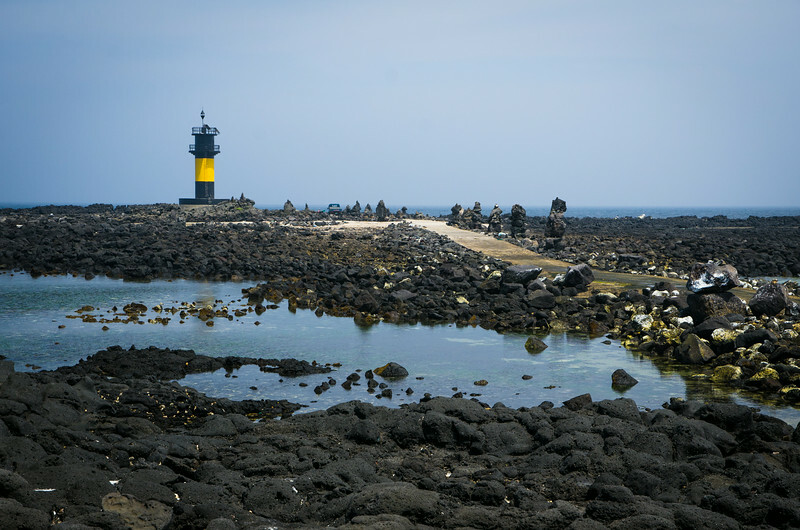 Leading you through rural pastures, suburban backwaters, along beaches, up mountains, across lava rock fields and under waterfalls, this is Jeju at its absolute finest! They are well signposted, they aren’t overly long, there are adequate toilet facilities and they are generally quite flat. 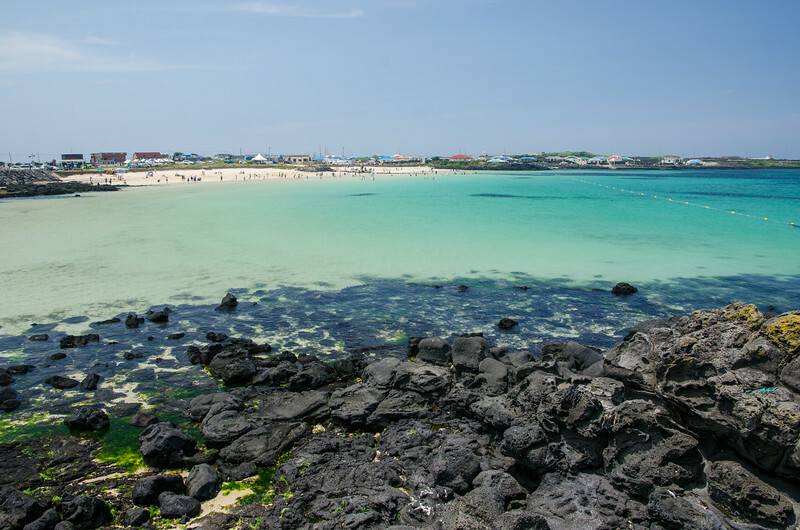 About the only thing you really need to think about is your transport options as only two sections are loop walks (one of which is Udo Island). If you’ve got two vehicles then you’re all sorted. Similarly, you could do many of the sections as a walk-out/walk-back, but if you’re going to rely on public transport then it could get a little bit more logistically difficult. For more information (In English as well!! ), the official Jeju Olle page can be found here. 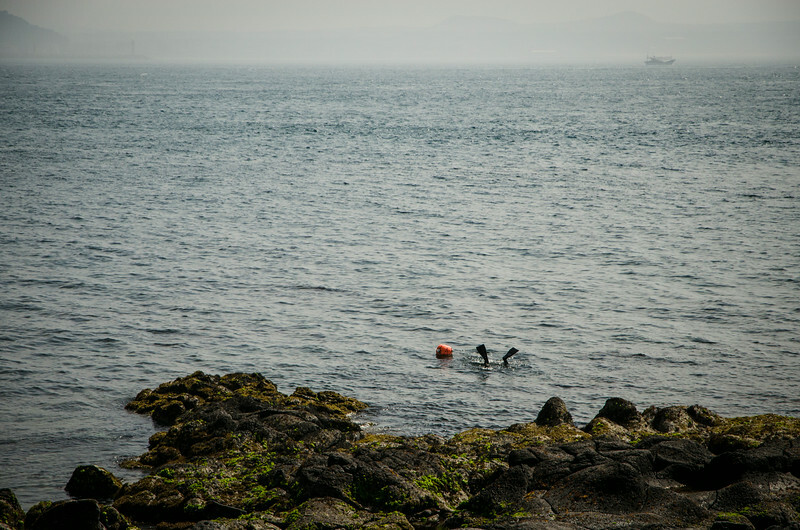 A link to the Jeju Olle page on the Korean Tourism website can be found here. In the image below, you can see Udo Island up in the top right, labelled 1-1. 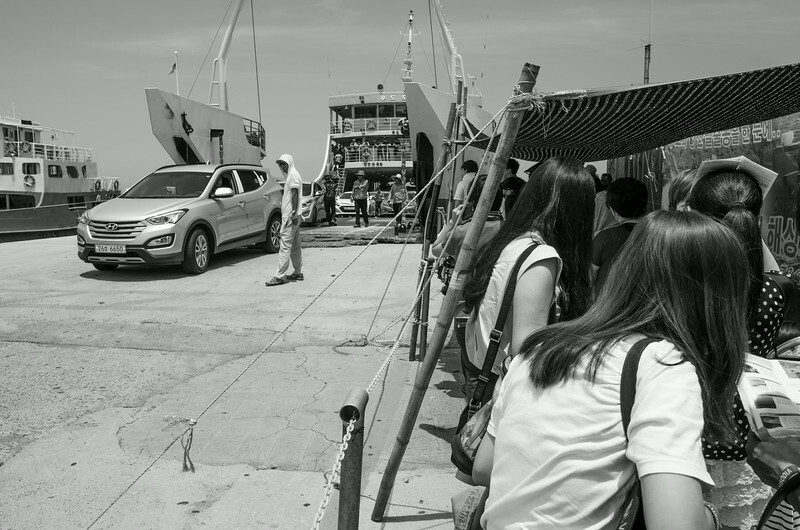 Leaving from Seogwipo, it took us a looong time to get to the ferry terminal at Seongsan Harbour. It was only around 50km, but with some pretty lame speed limits on some of the widest and most empty freeways I’ve ever seen, and knowing they have dozens of speed cameras en route, it took us about an hour and a half to get to there. The ferry terminal was absolutely crammed full of people, all looking to book themselves a ticket to Udo. I wish I’d taken a photo because it was mayhem! For anyone planning on going, just remember that there are two forms you need to fill in. It may take a bit of hunting around at the desks to find them both, but if you don’t have both then chances are they’ll turn you back at the counter where you buy the tickets. As the ferry departures are quite regular, this probably won’t matter to most, but if time is of the essence then this could be crucial. A ferry short ferry ride later and we were there! As it turned out, we had two big decisions to make on Udo Island. The first was to choose our mode of transport. Walk – normally our preferred option, but as my knee was stuffed from hiking up Hallasan the day before, this wasn’t an option. 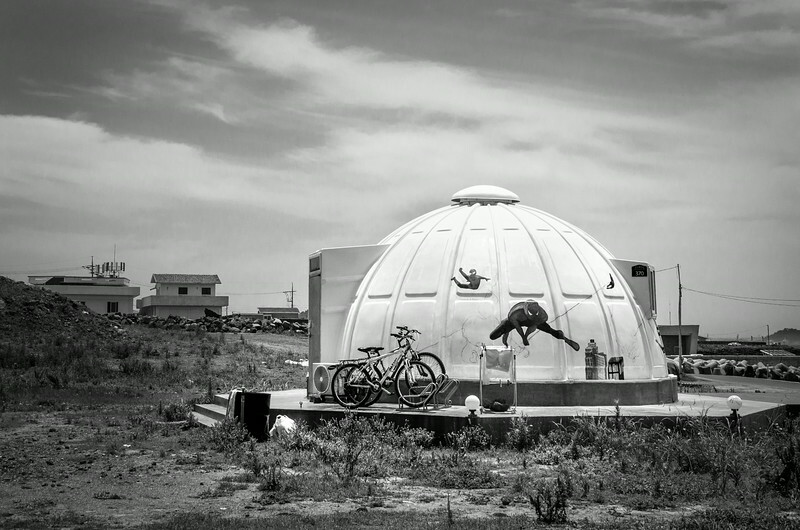 Bicycle – this was our choice. Fantastic mountain bikes in pristine condition, for the princely sum of around W10,000 each for two hours. Those who like to take their time may want an extra hour, but we found 2hrs to be adequate. Scooter – for W15,000 you could choose this option. It would have been a lot of fun, but I would have been paranoid about coming a cropper or knocking down one of the many other tourists on the island! Four wheeler motorbike – W20,000 for one of these beasts! Again, would be great fun. Four wheeled electric ‘thing’ – I don’t know how much they cost, but they looked great and they came with an overhead canopy to keep the sun off your head. If we had our time again I’d probably give one of these a go! Tourist bus – of the ‘hop on, hop off’ variety, W5,000 will get you a ticket on the tourist bus that circles the island. Not our cup of tea, but I can see how this may appeal to some. After mounting our trusty two-wheeled steeds, we spent the next couple of hours exploring the gorgeous volcanic coastline of Udo Island, wind in our hair and sun on our backs! 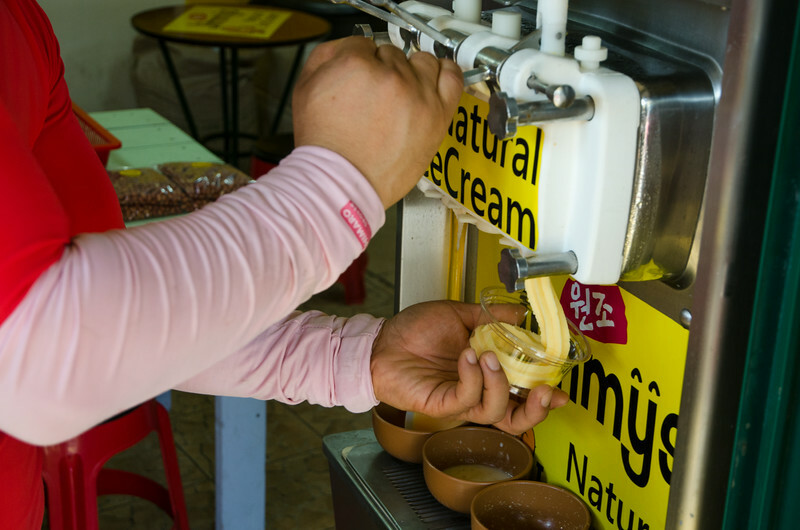 A specialty of Udo Island – peanut ice cream!! 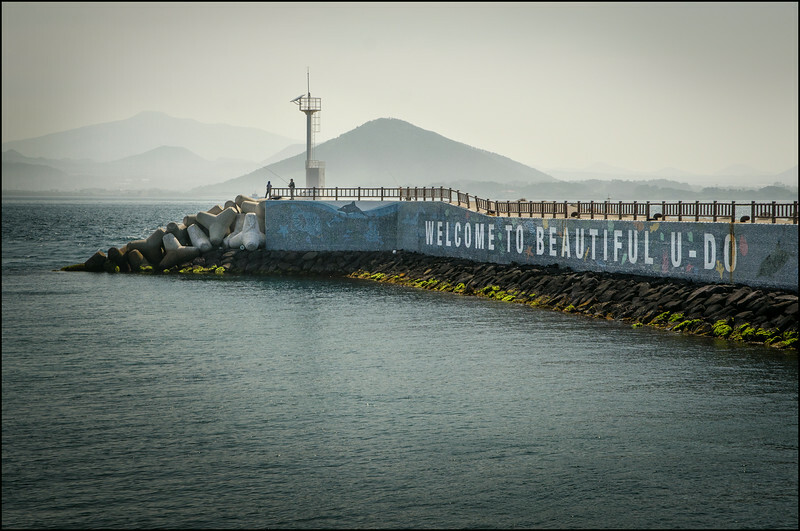 Seobin Baeksa beach – massively popular, and it was pretty obvious why! Our second big decision for the day was where to eat lunch? 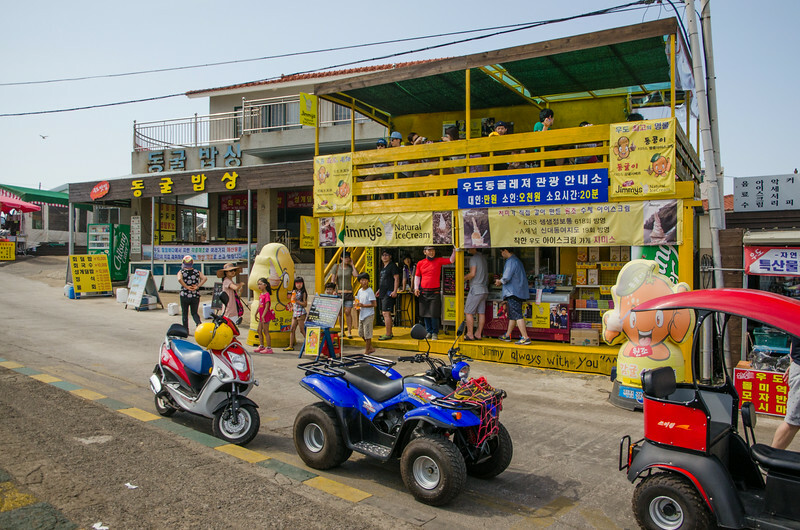 We were so close to caving in and going western at Seobin Baeksa beach but agreed to push on until we found the right venue serving up authentic Korean food. 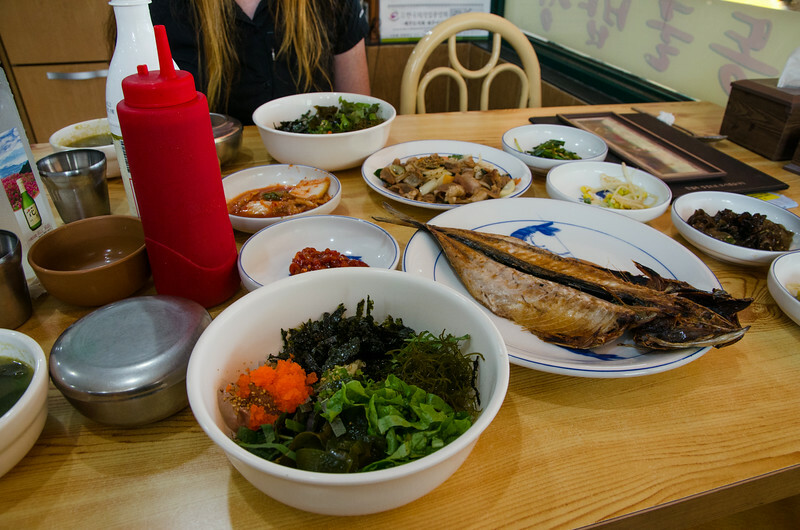 Such a good decision, because when we arrived in Geommeolle we found this fantastic place that not only had some English menus, but they also served up some local specialties, including sashimi bibimbap and egg roe, that tasted incredible! We also had the opportunity to try their own variety of makgeolli, this one being infused with peanut flavour. To be honest it was a little bit too close to Baileys for my liking! Our final thoughts on Udo Island? It was a great day and was actually one of the best experiences of our entire South Korean holiday. 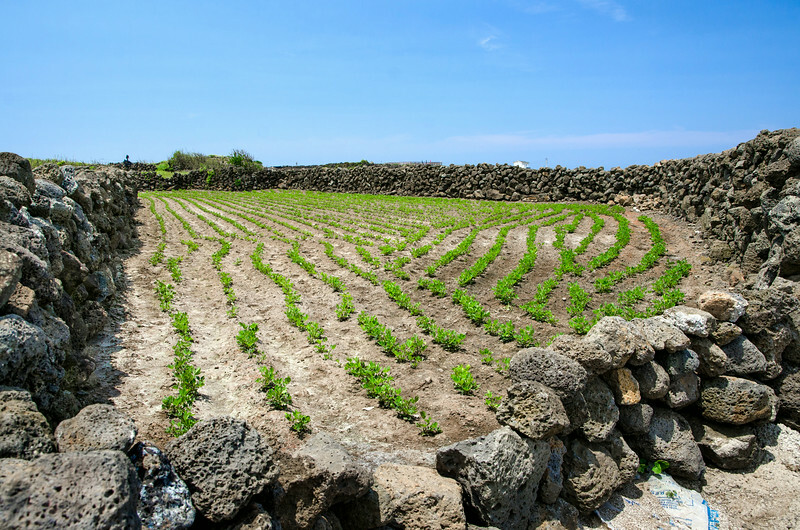 Yes, there are a lot of other locals and tourists sharing the island with you, but the landscape and the food more than make up for it! 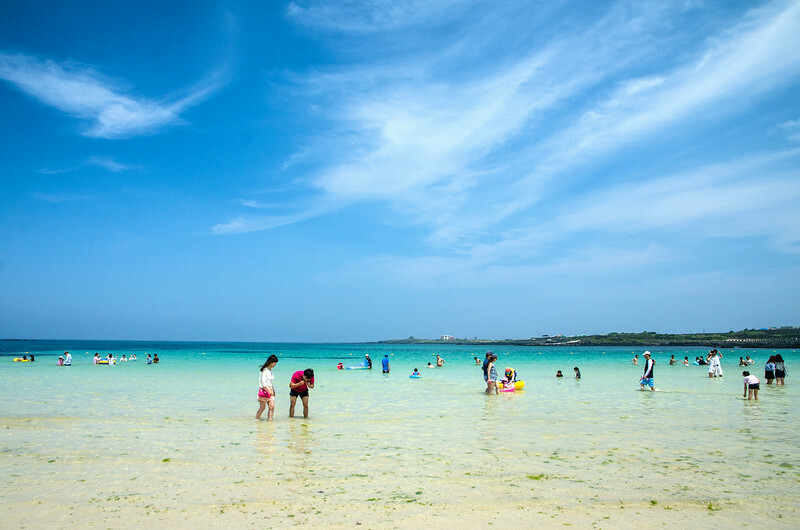 For more information regarding Udo Island, drop by the South Korean Tourism website here. 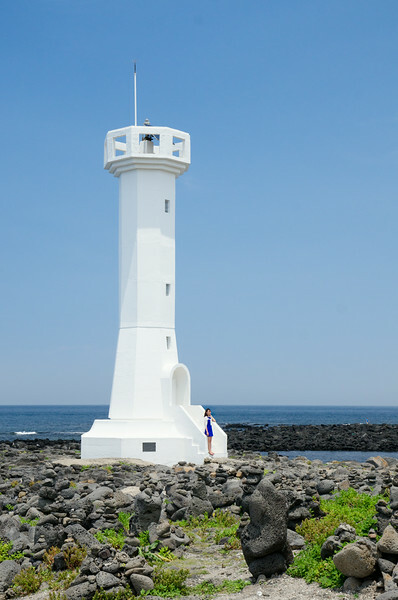 Looking for accommodation on Jeju Island? 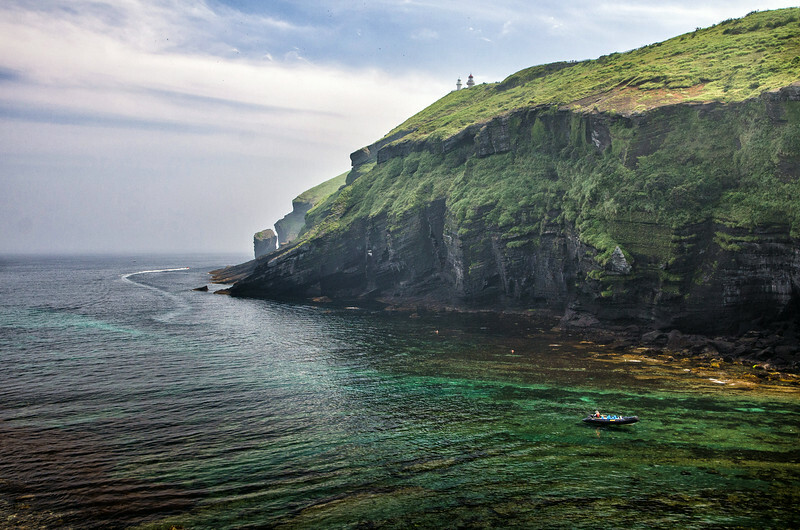 Chances are you’re probably tossing up between Jeju City in the north and Seogwipo in the south. We decided to go with Seogwipo and in hindsight it was definitely the right choice! hi! how long did you take on Udo? Just the two hours? Or would a whole day trip be better? thanks! We recommend allowing for at least two hours on Udo Island. In hindsight 3 hours probably would have been better, but we wanted to try and get to Seongsan Peak before heading home, so we weren’t taking things as easy as usual. Don’t forget that travel time to get there and back again could be an hour or more as well each way. When you take all that into account you’re probably best to put aside the day, but have a couple of options up your sleeve just in case you decide to leave early or it simply doesn’t take as long as you expected. 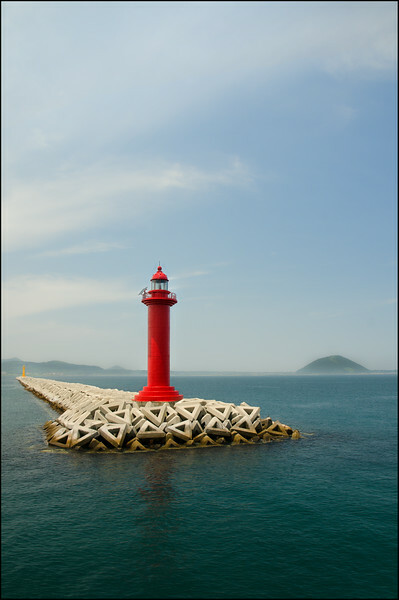 Seongsan Peak is a great option, as is Soesokkak Estuary on the south coast. Do you know if any of these vehicles could fit a family with 3 children? What about the golf carts? Many thanks!! If I recall correctly I think the golf carts could seat four people comfortably. Alternatively, the three wheelers would easily seat three, with a fourth needing to sit on one person’s lap if they were young/small enough. If you do a Google image search for some of those key words you may be able to get confirmation through photos. Having been to Jeju, I’m sad that we didn’t visit Udo. Honestly I didn’t realize that they are so mad about peanuts there. Definitely marking this down as a possible place to go. It’s strange, because I didn’t see any obvious peanut farms, but they obviously love it! Well worth a visit.